Protein A magnetic beads optimized for efficient purification of IgG from cell cultures. LOABeads PrtA are protein A coupled magnetic agarose beads specifically developed for the purification of monoclonal IgG antibodies from cell culture harvests, such as from hybridoma and CHO cell cultures. The high specificity and high capacity of LOABeads PrtA ensures that a very pure antibody is obtained with a high yield, even when antibody capture is performed directly in the cell culture medium. The black beads are clearly visible and easily attracted to external magnets, enabling distinct separation within seconds, which leads to minimal sample loss. The 4% agarose matrix offers negligible unspecific binding and makes the beads non-adherent. This lets them be easily dispersed and resuspended without the use of detergents. LOABeads PrtA are ideal to use in many applications of magnetic bead affinity chromatography (MBAC). For example in lab-scale purification of antibodies to be used in R&D and diagnostics, and for characterizations of candidate biopharmaceutical IgG antibodies. The quantity of beads can readily be scaled up or down and regardless of scale, the same conditions will provide equal yield and purity. For analytical and small-scale preparative work, as well as method scouting, samples can be handled in standard 15 and 50 ml centrifuge tubes using the LOABeads Magsep50 separator. 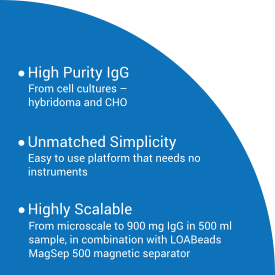 In the LOABeads MagSep500 unit, 30 ml of settled beads in a 500 ml sample can be handled, giving a maximum adsorbent capacity of 900 mg IgG. LOABeads PrtA supplied as a 10% bead suspension in PBS with 20% ethanol. 10 ml of 10% bead suspension contains 1 ml magnetic beads. * Binding capacity was determined by incubating 50 μl LOABeads PrtA30 with rabbit IgG (~2 mg/ml in 1 ml PBS) for 60 minutes at room temperature. Binding capacity is obtained with a yield of 90% or more under the conditions specified above.